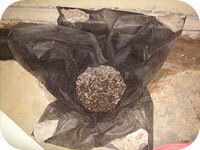 I use pits that are made from thick, recycled plastic which holds its shape when installed. The pits have smooth sides that do not interfere with the switch float on the pumps. I drill my own holes in them and tie the drain tile in with a four-inch hole saw. I perforate the pit so that water can seep in from all directions. 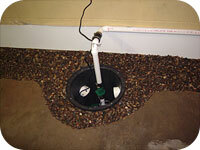 The pits have a one-piece lid that can be sealed if you need a radon mitigation system. 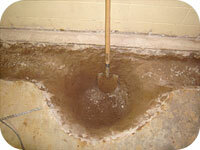 These pits are also deep enough to hold two pumps and lower the water table under the floor. Drain tile doesn't do any good if the pump fails. I use the best pumps I have found. I have been installing Zoeller pumps since 1989 with great success. Zoeller makes different sized pumps for a variety of situations. I normally install a Zoeller M53 one-third horsepower pump. Zoeller also makes a great little battery backup pump for when the electricity goes out. The combination of these two pumps gives you peace of mind and confidence that your pump will work even if the power goes out. As long as your pump is working, your system will work. Exit lines are normally one-and-a-half-inch PVC pipe buried far enough away from the house that the water will not reenter the foundation. 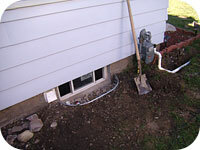 I install a vent and a tee where the pipe exits the foundation. This vent allows air to get into the pipe so that the water can flow freely from the exit line. I always discuss the exit line with the customer and come up with a workable solution.